China’s growth slowdown and the decline in commodity prices appear to be having an adverse impact on the biggest economy of Southeast Asia, namely Indonesia. Exports, which have been a main contributor to the country’s economic growth, have declined steadily due to lower commodity prices and weak global demand. However, real GDP growth, which slowed to 4.8% last year, is expected to rise to 5% this year and 5.3% in 2017. The main driver of growth is private consumption, which accounts for around 60% of the country’s economic activity. Against this backdrop, businesses in Indonesia appear to be confronted with a number of challenges, that seem to adversely affect their liquidity position. Survey findings highlight how suppliers in Indonesia protect their businesses against the risk of payment default arising from B2B trade on credit domestically and overseas. With an average of 43.1% of the total B2B sales value made on credit (which is almost in line with the 46% average for the region) suppliers surveyed in Indonesia show a stronger preference for requesting payment methods from their B2B customers which do not expose them to the risk of not being paid when due. This conservative approach to the use of trade credit in B2B transactions is similar to that seen in China and Taiwan. Over the past year, the proportion of B2B sales made on credit by Indonesian suppliers dropped sharply. This is particularly the case for foreign sales (-8.2% compared to last year). This may reflect the steady decline in Indonesian exports over the past year, mainly due to lower commodity prices and weak global demand. With 48.1% (50.5% last year) of the domestic and 38.1% (46.3% one year ago) of the foreign B2B sales value transacted on credit, suppliers surveyed in Indonesia were, on average, notably more likely to offer credit terms to domestic B2B customers than to foreign ones (averages for Asia Pacific: 50.3% domestic and 42% foreign). This behaviour is consistent with that observed across most of the region, with the exception of Australia, Hong Kong and Singapore, which show a more uniform approach to granting trade credit terms to either domestic or foreign B2B customers. 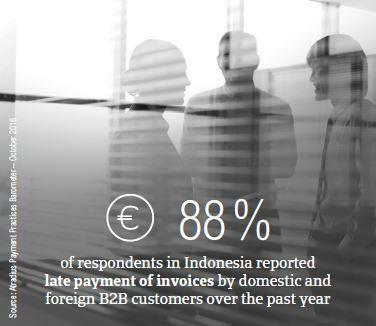 As many suppliers surveyed in Indonesia (88%) as in Asia Pacific reported having experienced late payment of invoices by domestic and foreign B2B customers over the past year. This resulted in an average of 41% of the total value of B2B receivables, unpaid by the due date. This is slightly below the average for Asia Pacific (44%). On average, 43% of the total value of domestic B2B invoices in Indonesia was reported to be paid late. This was the case for nearly 39% of the total value of foreign invoices. The foreign percentage for Indonesia is lower than the average for Asia Pacific, indicating that Indonesian exporters are less impacted by foreign late payment than their peers in the region. Over the past year, both the domestic and the foreign default rates in Indonesia remained stable. Late payment of (domestic and foreign) B2B invoices in Indonesia is reflected in the average Days Sales Outstanding (DSO) figure of the survey respondents in the country. Despite no variation in both domestic and foreign late payment rates in Indonesia, the average 46 days DSO recorded in the country (equal to that in Singapore) is above the 41 days regional average and two weeks longer than last year. This increase in DSO, which is the highest recorded in Asia Pacific, may point to a significantly lower success of suppliers in Indonesia in collecting long overdue high value invoices. A staggering percentage of suppliers surveyed in Indonesia (72%) expect an increase in DSO over the next 12 months. Two in five of these are of the opinion that this increase will be significant. 13% of surveyed suppliers expect no change, and 15% expect a decrease. The increase in DSO expected by Indonesian suppliers may reflect their concerns about efficiency in receivables management. More suppliers in the country (14%) than in Asia Pacific, in fact, consider this, along with the capability of having an accurate view of the risk arising from their customers’ portfolio, as the greatest challenge to business profitability this year. Most of the suppliers surveyed in Indonesia (18%, compared to 20% in Asia Pacific ) consider maintaining sufficient cash flow, as well as cost containment, as the greatest challenges to business profitability this year. This opinion tallies with the expected increase in DSO commented earlier on, which signals a strong worsening in the receivables performance of Indonesian suppliers. This latter would also explain suppliers’ concern about containment of costs, not only those associated with carrying outstanding trade receivables, but also those related to the impact of low commodity prices on the country’s economy. Consistent with this, more suppliers in Indonesia (14%) than in Asia Pacific consider both efficiency in receivables management and the capability of having an accurate view of the risk arising from their customers’ portfolio as the greatest challenges they will be confronted with this year. Indonesian suppliers request domestic B2B customers to pay invoices within an average of 29 days from the invoice date (average for Asia Pacific: 32 days). Foreign customers are requested to settle invoices within the same time frame (average for Asia Pacific: 33 days). Over the past year, both domestic and foreign payment terms offered by Indonesian suppliers have been extended by an average of four days. The slightly less rigid payment terms to both domestic and foreign B2B customers may reflect the difficult business environment in which Indonesian suppliers currently operate, chiefly due to the impact of the slowdown in China, and of lower commodity prices in many emerging countries in Asia and in the major industrial economies Indonesian suppliers trade with. Despite being granted longer payment terms than last year, B2B customers of Indonesian suppliers make past due payments within the same time frame as they did one year ago (on average, 27 days after the invoice due date). This means that Indonesian suppliers interviewed turn overdue invoices into cash, on average, around two months from invoicing. This is in line with the average for Asia Pacific. 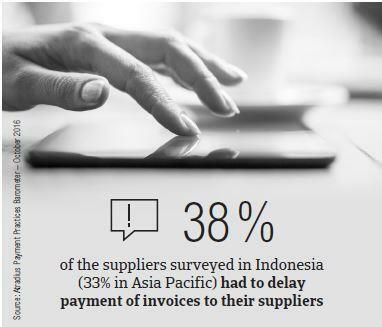 Significantly more suppliers in Indonesia (56%, up from 51% last year) than in Asia Pacific (46%) are of the opinion that their domestic B2B customers pay invoices late due to insufficient availability of funds. This response rate for Indonesia is the highest in Asia Pacific. This suggests that Indonesian businesses experience a much stronger pressure on their liquidity position than that experienced by businesses in other countries in Asia Pacific. 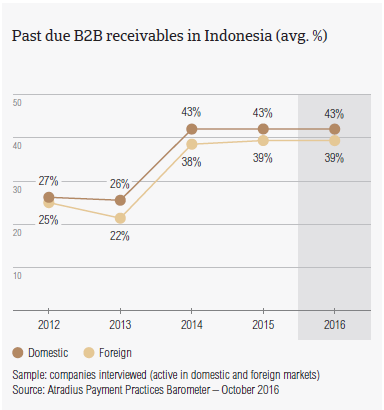 This assumption is corroborated by the 34% of Indonesian suppliers (up from 30% last year, and compared to 21% in Asia Pacific) who reported that domestic B2B customers delay payment of invoices due to formal insolvency (liquidation, receivership, bankruptcy). Also this response rate for Indonesia is the highest in Asia Pacific. Consistent with slowing growth and challenging business conditions in most of the major destinations of Indonesian exports, most of the suppliers surveyed in Indonesia (36%, up from 30% last year and compared to 34% at regional level) reported that foreign late payment is most often due to liquidity constraints of the customers. However, in line with what was experienced most often by suppliers in Asia Pacific, also those in Indonesia said that late payment from foreign customers is most frequently attributable to the complexity of the payment procedure (35% of respondents in Indonesia, compared to 38% in Asia Pacific) and inefficiencies of the banking system (34% of respondents in Indonesia, versus 30% in Asia Pacific). Regardless of the reasons why B2B customers pay invoices late, notably more suppliers in Indonesia (46%) than in Asia Pacific (34%) reported that they had to take specific measures to correct cash flow. 38% of the suppliers surveyed in the country (compared to 33% regionally) had to delay payment of invoices to their suppliers, thus triggering a knock-on effect throughout the whole supply chain. The pursue of additional financing from banks, factors or others was mentioned by 29% of Indonesian suppliers, compared to 24% in Asia Pacific. These findings tally with the strong pressure on the liquidity position of businesses in Indonesia mentioned earlier on in this report. To protect their businesses against the risk of payment default from B2B customers, most of the suppliers surveyed in Indonesia (61%) will either sell more on cash terms or they will more often check the payment history of the customers, when they opt for selling on credit. Significantly more suppliers in Indonesia (56%) than in Asia Pacific (42%) will more often request secured forms of payment from their customers, check the creditworthiness of their customers more frequently over the next 12 months. 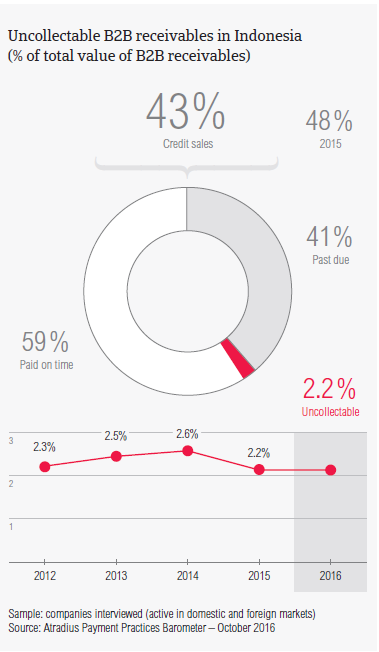 Suppliers in Indonesia reported having written off 2.2% of the total value of B2B receivables as uncollectable. This is in line with the average for Asia Pacific (2.1%). Domestic uncollectable receivables were written off less often than foreign ones. The percentage of write-offs in Indonesia remained stable from last year. This is likely to reflect no change in the efficiency of the outstanding collection process undertaken by suppliers in Indonesia. Uncollectable domestic B2B receivables originated most often from the construction, consumer durables and services industries. Most of the suppliers surveyed in Indonesia (62%, compared to 51% at regional level) reported that they had to write off receivables as uncollectable most often because the customer went bankrupt or out of business. These finding tallies with the challenging insolvency environment in Indonesia commented earlier on in this report. Notably more suppliers surveyed in the country (around 40%) than in Asia Pacific (34%) said that they wrote off receivables as uncollectable due to either the failure of the collection attempts, the fact that the customer could not be located or that the debt was too old to be collected. Suppliers surveyed in Indonesia reported trading on credit terms mainly with B2B customers in the chemicals, construction, consumer durables, food and business services industries. Invoice payment terms extended to B2B customers across these industries do not appear to substantially differentiate from the country average (29 days from the invoice date). The strictest terms for payment of invoices are granted to B2B customers in the food industry (averaging 21 days from the invoice date). B2B customers in the construction industry take the longest to pay overdue receivables (on average, within 41 days after the invoice due date, compared to a 27 days average for the country ). The chemicals industry follows, with a payment delay from B2B customers averaging 36 days from the invoice due date. Both the construction and the electronics industries generated the largest proportion of past due B2B invoices, with nearly 55% of the total B2B invoices’ value paid late. Late payment in the Indonesian food industry amounted, on average, to 38% of the total B2B invoices’ value paid after the due date. Based on survey responses, late payment of invoices due to liquidity constraints from customers occurred most often in the chemicals industry (56% of suppliers surveyed in Indonesia cited this). This is also the industry where most of the B2B customers were not able to meet their payment obligations due to formal insolvency (this according to 58% of the Indonesian suppliers selling on credit in this industry). Most of the suppliers surveyed in Indonesia (65%) are of the opinion that the payment practices of their B2B customers in the industries they mainly trade with (see above) will not change over the next 12 months. This with the exception of the agriculture and the food industries. In the former, 41% of the Indonesian suppliers expect a deterioration of the payment behavior of their B2B customers over the next 12 months., while in the latter 35% of Indonesian suppliers expect a deterioration over the next 12 months.